If you haven’t already heard of the Grocery Manufacturer’s of America and their aims at stopping Initiative 522 from passing in Washington just days from now, you will shortly. With companies like Monsanto taking the lead, millions of dollars have been funneled illegally through a slush fund to try to sway voters against passing the 522 Initiative that would require grocery stores that sell foods containing GMO food to label it as such. This group of slick corporate greed-mongers only disclosed their ‘donations’ to the fund after state Attorney General Bob Ferguson filed a lawsuit earlier in October. More than $1 million has already been used to try to defend organic and right-to-know activists from getting their labeling bill passed. The companies know that the word is out, and if they don’t spend a king’s ransom on misinformation campaigns and propaganda then the 522 Initiative will be voted down. Last year when a similar bill was up for a vote in California, Prop 37, these same corrupt corporations spent more than $46 million making sure they didn’t have to label anything as GMO! The largest donors, along with Monsanto, include ConAgra, General Mills, Pepsi Co, Coca-Cola, Kellogg Company, Campbell’s Soup Co, Land O’ Lakes, Ocean Spray, Cargill, Dean Foods and the Hershey’s Chocolate Company. The state attorney general’s office said it would no longer seek an injunction to force the Grocery Manufacturers of America to reveal its donors because the trade group did so voluntarily. Ferguson’s office, however, said it has no plans to call off its lawsuit against the trade group, which illegally funneled a record-setting $7.2 million to No on 522. …The Grocery Manufacturers of America’s most recent injection of $3.78 million from its political committee was reported last week, less than two weeks before Washington voters head to the polls. 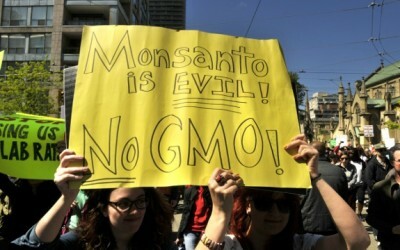 Monsanto also made a last-minute donation of $540,000. According to state records, the anti-GMO labeling companies have raised more than $21 million and already spent $13.5 to try to defeat 522 in Washington. Show them their money is useless and call, write, email, picket, or throw a tantrum in front of a Washington official until they listen. 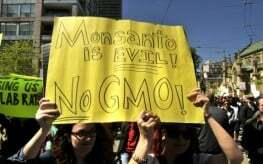 The majority of us want GMO labeling to pass. What is the old saying? You can fool some people all the time, all the people some of the time, but you cannot fool all the people all the time. I think Jon Rappoport hit the nail on the head. Going for labelling is a perfect ploy for the FMA & MonSatan. never see or grasp, and b) opens a gate to more distortion, manipulation and engineering of the products. animals. That is what they really fear, not some cosmetic labelling.